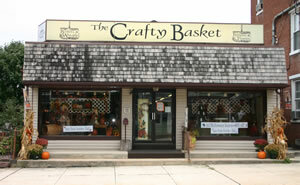 The Crafty Basket is located just up from the square in Dover, PA and specializes in country folk art. While some art is produced by using prefabricated pieces, the art created as a whole are original. The Crafty Basket is owned by Brenda and Mike Eckenrode and has been in business for thirteen years. Their work is displayed gallery-like and the original art pieces are signed by the artist. The first piece I chose was a Christmas ornament. The plastic ornament was originally blank and the edges were raised to show texture. Brenda Eckenrode painted a whimsical snowman using acrylic paint depicting a realistic winter scene. The snowman wore a red scarf and mittens complimenting his carrot nose and contrasting with the cool, blue background. He was centered on the ornament and had a cheerful look to his face. The top right side portrayed a top hat held in his left hand. Balancing out the Christmas ornament was a white star on the left side of the heart-shaped piece. A simple white ribbon to display the piece was attached at the top. The second piece was a soft sculpture of a grandmother like doll. Her face was incredibly natural looking as Brenda used nylon stocking material to create the head. The dolls outfit was a composition of cotton material, lace and ribbon all hand sewn. Many pieces used to create this realistic soft sculpture would be considered “found objects” such as the tiny wire glasses, hair and the single flower in her hand. Attached to the back of the doll sculpture was a magnet. This was not actually part of the art but did make it easy to display and view. The third piece of art, Lilac Milkcan, would also be considered “found objects.” This arrangement was created using artificial white lilacs with deep green foliage. The milk can was painted a robin’s egg blue and made to look antique. By this I mean it was purposely painted to look used. There were portions, especially around the handles and base where the paint had been thinned down to barely cover the tin. This floral arrangement was especially appealing to my eyes because of the analogous colors of green and blue. Had the milk can been painted green it would not have made the foliage pop between the white lilacs and the milk can. The forth piece was a print titled Autumn Afternoon by Billy Jacobs of Ohio. This picture appealed to me because the subject or focus point seemed to be the crows on the fence. The crows were large in scale and towards the bottom of the piece. They were perched on a fence that created horizontal and vertical lines showing its stability as well as unity and rhythm. My eyes followed the fence line which led to a tree created with diagonal lines. The diagonal lines kept my eyes moving over the picture to the house in the background. Though the house is clearly much larger than the crows, Jacobs painted it at the top of the picture makes it appear correct in scale. The colors used in this piece were warm variations of red, accurately depicting an autumn day. The fifth piece is a birdhouse sculpture. This was created by Mike from trees cut down on the Eckenrode property. Each piece of the birdhouse was cut and planed by Mike then assembled. He added vines woven together created diagonal lines around the birdhouse. Each bird hole was placed at equal distances creating unity in the piece and the rectangular nail under each hole gave it a nice visual rhythm. This sculpture has a rustic look because the boards were not sanded completely smooth. Instead there is a rough texture left on the surface and was painted a washed out blue color making it appeared to be faded with age. The base and the roof sections were painted black and broke up the color scheme. This piece made me think of sculpture in the round because it can be viewed from all sides. It also made me think of earth art, not in the traditional sense but because it was made of items found naturally on earth with the exception of the nails. The sixth piece I chose was the simplest of all, a wooden shelf. This was also made by Mike from trees grown on their property. I thought of it as functioning art because it was very appealing due to its simple assemblage and primitive look but once hung, could be used to display other works of art. Unlike the birdhouse which I don’t think could actually function due to its scale, the shelf is the perfect size to hang on a wall. Mike sanded it smooth and stained it black in color. All the edges were lighter in color highlighting the horizontal and vertical lines. The monochrome color would complement any room as well as anything placed on the shelf. I found it simply beautiful. The art found at the Crafty Basket took me back to a simpler time of life. The farmhouse in Billy Jacobs’ picture would be the exact location for the primitive, rustic art created at the Crafty Basket. A York or Lancaster County farmhouse or even better, log house, would be ideal. After talking to the Eckenrodes and learning their items were handmade and painted on location I had a deeper appreciation for this simple art form. Art of this type is also made cheaply overseas and when I compared their handmade version against the imported type, the quality difference was clear. The Eckenrode’s art was clean in appearance, not sloppily put together or painted on an assembly line. The soft sculpture doll was just outstanding because the time put into making it was obvious. There were no loose strings hanging from the material, nor was it made with poor quality “found objects.” The Christmas ornament was skillfully painted by an artist, Brenda, not an anonymous person sitting in a factory. In sketching each piece it forced me to look closely at how it was made, arranged or painted and appreciate the skill needed to create folk art.